Munger painted multiple views of the west front of the Wasatch Range behind Salt Lake City. 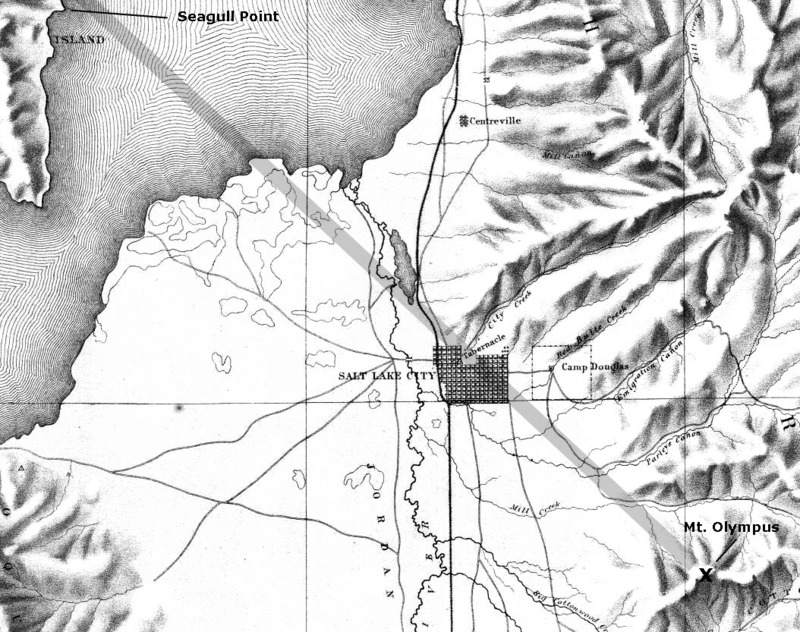 These paintings can be grouped into two categories: those showing the Great Salt Lake in the foreground and those showing land in the foreground. Both groups of paintings have caused some concern as to their accuracy. In the following discussion it may be useful to refer to Clarence King's map of the area published in 1878. The first group shows the lake lapping at the edge of downtown Salt Lake City and shows the mountains very near the lake edge as well, for example as in painting #58 in the photo to the right. Yet local inspection and any map show that the lake is several miles west of downtown (and was in 1869), and that the mountains are many miles southeast of the lake shore. Many observers wonder whether Munger has juxtaposed the lake, city, and mountains to gain scenic effect. This observation was troubling, as if true it would represent an exception to Munger's general practice of painting topography accurately. Genevieve Atwood, a Salt Lake area geologist and expert on the levels of the lake, has set this issue to rest. We note that the painting #58 shows the partially finished Tabernacle (at the end of the "downtown" arrow) on the lake shore just the right of the summit of Mt. Olympus. On a map, drawing a line from Mt. Olympus over the Tabernacle and extending it out into the Great Salt Lake leads to the eastern shore of Antelope Island in the vicinity of Seagull Point. Ms. Atwood has kindly provided this photo taken from just south of Seagull Point. Even though the lake level is considerably lower in the photo than it was in 1869 for Gilbert Munger, we see that the lake indeed does appear to lap at the edge of the city and at the base of the mountains. Thus, we conclude that Munger was painting from the vicinity of Seagull Point and that he painted what he saw. Careful inspection of the relative positions of the peaks in painting #58 and Ms. Atwood's photo shows us two other things: 1) that Munger was likely a little further north than Ms. Atwood, since in the painting Mt. 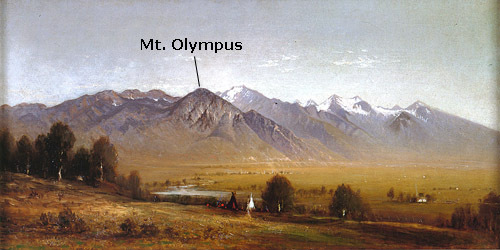 Olympus lines up with downtown Salt Lake City; and 2) that Munger is presenting a view of the mountains as seen from closer up, since in the painting the summit of Mt. Olympus is higher than the ridge behind it. To get Mt. Olympus to show higher the the ridge, as it does in the painting, the artist would need to be closer to downtown, as shown here. The Wasatch paintings with land in the foreground also have an apparent geographic anomaly. Consider painting #218 in this photo. Seemingly a fairly large river is wandering through the middle of the painting. The only substantial river in the vicinity is the Jordan, which flows north from Utah Lake into the Great Salt Lake. Even though there is no rising ground anywhere near the northern portion of Jordan River; the artist positions himself on some high ground. Is the river or the high ground misplaced? Geologist Richard Giraud of the Utah Geological Survey suggested the solution. The water in these paintings is not the Jordan River, but one or several of the streams issuing from the Wasatch canyons, and ponds or impoundments associated with these streams. The streams flow into the Jordan River further west (to the right in the painting). The area that contains these streams is closer to the base of the mountains just east and south of downtown Salt Lake City, and it has rising ground bordering on the north. All of the paintings with the artist on a rise fit this pattern convincingly. Mr. Giraud believes that the open water in the painting #218 is most likely the pond now located in Liberty Park. Some of the Wasatch paintings with a river or stream in front of the Wasatch do not have the artist on a rise, for example painting #152 as show here. In these cases the stream probably is the Jordan River. Reinforcement for this view comes from tracking the tree lined water courses to the left of the river in the painting. They correspond well with canyon steams flowing west to meet the Jordan.